PAGE 4 JEWISH PRESS of TAMPA MARCH 23 APRIL 5, 2018 rfrfn tbfbfbbfbfbrbb nbbbbbbbbbbb rrbnbb fffbffbrfnt nbbnnbr rfrbbb rrbtr r rent-all cityinc.From Simchas to Seders Your Event HeadquartersVISIT OUR SHOWROOM7171 22nd Ave. N., St. Petersburg(just west of Tyrone Square Mall)Tables, Chairs, Linens, Chair Covers, China, Silver, Stemware, Tents, Stages, Dance Floors, Star of David Candelabras, Chuppah and much more!Serving Extended Tampa Bay Area(727) 381-3111 www.rentallcity.com Owned and operated by the Pinsker family since 1960From our family to yours Happy Passover Visit us on both sides of the Bay Shipping and Gift Wrapping Available Hyde Park Village St. Petersburg 1619 W Snow Circle Tampa, FL 33606 813.831.2111 Shabbat Candlesticks Hamsa Necklace 300 Beach Drive NE St. Petersburg, FL 33701 727.894.2111 www.shapirogallery.com You can also shop online! Former Israeli Ambassador to the U.S. Danny Ayalon will be guest speaker at a free Jewish National Fund breakfast for Israel Â on Tuesday May 1 from 9-10 a.m. at the Bryan Glazer Family JCC in Tampa. Ayalon was born in Tel Aviv in 1955, viewing himself as the product of the ingather ing of the exiles, the intersection between the Jewish Diasporas of East and West, Sephardic and of Israels reestablishment. His father came to Israel from Algeria before the War of Independence in 1948 and fought in the Golani Brigade. His mother immigrated there in 1937 from Poland, escaping the Holocaust, in which members of her extended family perished. She also fought in the War of Independence in Jerusalem and was wounded in battle. Ayalon served in Israels Foreign Service for more than 20 years, beginning in Panama, and then the UN mission in New York. He was political adviser to three different prime ministers: Ehud Barak, Benjamin Netanyahu, and Ariel Sharon. In 2002, he was named Israels ambassador in the U.S., serving in that capacity for four years. During my ambassadorial tenure, Israel-US relations increased and improved, with American support of Israel reaching an all-time high in many areas, Ayalon writes on his website. Upon retirement from the diplomatic service in 2006, he joined Nefesh BNefesh, an organization committed to revitalizing Aliyah, and the Or Movement for settlement in the Negev and the Galilee, both issues he believes should be top national priorities. Thats not but a Zionist imperative and also a moral obligation upon us and future generations, he says. In February 2009, he was elected a member of the Knesset and soon after was named deputy foreign minister, serving in the parliament until 2013. Among his many pursuits since then, Ayalon has served as a visiting professor of foreign policy at Yeshiva University. He recently founded The Truth About Israel, a attempts to delegitimize Israel and strengthen its political status and image. Chair for the breakfast program is Lynne Merriam. RSVPs are requested to jnf.org/ tampabreakfast by April 20. Dietary laws will be observed. The JCC is at 522 N. Howard Ave., Tampa.JNF breakfast to feature former Israeli Ambassador Ayalon Danny Ayalon Florida Gov. Rick Scott has signed a bill that prohibits state agencies and local governments from contracting with companies that are boycotting Israel. Scotts bill-signing ceremony Wednesday, March 21, at the Or lando Torah Academy, a Jewish day school, also allowed him to highlight the $2 million that was included in the state budget to allow such schools to harden security against terrorist and other potential attacks. Funding will be used to help provide upgrades such as video cameras, fences, bulletproof glass, alarm systems and other safety equipment. Â Last year, the state legislature approved more than $650,000 for security at Jewish day schools. The governor touted the states strong relationship with Israel in signing the anti-BDS legislation. with our ally Israel. In 2016, I was proud to sign legislation that prohibited the state, or administration, from investing in companies that boycott Israel. Today Im proud to sign HB 545, an important piece of legislation that builds on our efforts by prohibiting any state agency and local governments from contracting with companies that boycott Israel, said Scott. In 2016, Gov. Scott signed legislation that prohibits the State Board of Administration from investing in companies that boycott Israel. Gov. Scott also supported the U.S. Embassy moving from Tel Aviv to Jerusalem. In December, he led a delegation of Florida business and education leaders on a second trade mission to Israel. During the 2011 mission, Scott signed the Florida-Israel Memorandum of Understanding Agreement between Space Florida and Israel, to support research, development and aerospace and technology projects. Floridas total economic development and trading partnership with Israel exceeds $283 million a year.Students from the Orlando Torah Academy look on as Gov. Rick Scott signs a bill that prohibits public entities from dealing with companies that boycott Israel. Scott signs pro-Israel bill; touts $2m in budget for Day School securityCorrectionCongregation Beth Am in Tampa is sending 11 teens and three chaperones to the March for Our Lives in Washington. D.C. on March 24. Temple Bnai in Clear water is sending eight teens and three chaperones; Temple Beth-El in St. Petersburg is sending four teens and two chaperones and Temple Ahavat Shalom in Palm Harbor is sending one teen. A story in the March 9 issue of the Jewish Press contained incorrect numbers for how many people were going to the march from each congregation. JEWISH PRESS of TAMPA PAGE 13 MARCH 23 APRIL 5, 2018 www.MenorahManor.org 240 59th Street North, St. Petersburg FL 33710 AL#10306 Personalized Support Respite Stays Available Large Private Apartments Life Enriching Programs SPRING SPECIAL!$2,500 Community Entrance Fee Waived AND $500 OFF Monthly Rental for 1st 6 MonthsOFFER EXPIRES APRIL 30, 2018Call 727.302.3800 to schedule a tour and ask about a free 2 night trial! Street North, St. Petersburg FL 33710 This coupon is not valid in combination with any other coupon, special, promotional offer or team member discount. Coupon only valid at the Whole Foods Market Carrollwood, Clearwater and Tampa locations. No duplications, copies, facsimiles or mobile coupons will be accepted. This coupon may not be used towards the purchase of a Whole Foods Market Gift Card. No cash value. Please, only one coupon per household per day. Coupon good for $10 off total one-time purchase of $50 or more. Coupon valid through 4/8/2018. Mon. Fri. 6:00 am Noon Sat. & Sun. 6:00 am 1:00 pmBoiled & Baked the traditional way at the same location for over 30 years!1871 Gulf To Bay Blvd. (Clearwater)~ Next to Clearwater High School ~(727) 446-7631 JP A feature-length documentary, GI Jews: Jewish Americans in World War II, will air nationwide on PBS stations on Wednesday, April 11 at 10 p.m. 550,000 Jewish Americans who served their country in all branches of the military during World War II. Filmmaker Lisa Ades (American Experience: Miss America) brings the struggles of these brave men more personal war to liberate loved ones in Europe. After years of battle, these pioneering servicemen and women emerged transformed: more profoundly American, more deeply Jewish, and determined to GI Jews premieres April 11 on PBS (check local listings) in honor of Holocaust Remembrance Day following day on pbs.org and PBS apps. GI Jews features more than 25 original interviews with veterans who speak candidly about the impact served in the Army; Henry Kissinger, a refugee from Nazi Germany who was drafted into the Army; Carl Reiner, the son of Jewish immigrants, who traveled vices Entertainment Unit; the late Bea Cohen, who the 1st infantry division and was the cantor at a Jewish service in Aachen, Germany, broadcast by NBC in 1944. While Jewish Americans relationship to the Holowell-known saga of World War II to life in a new way who produced and directed the documentary. In addition to battling the enemy, Jewish Americans fought a second, more private battle against antiSemitism within the ranks. They sought to observe their religion far from home while enduring slurs and even violence from their fellow servicemen. These Jewish Americans were often felt forced to prove their courage and patriotism. Fighting together they forged deep friendships across religious lines and learned to set aside their differences for the greater good. In the aftermath of the Holocaust, Americas Jewish community was now the largest in the world, and by the end of World War II, the United States had begun to embrace its Jewish citizens as true Americans. With their new responsibility as international leaders, many Jews became passionate about postwar culture Film on PBS documents service of Jews during World War II From the documentary GI Jews, which will air in honor of Holocaust Remembrance Day. PAGE 14 JEWISH PRESS of TAMPA MARCH 23 APRIL 5, 2018 JEWISH COMMUNITY CENTERS & FEDERATION Tampa And lots of ways to be part of Federation. To make matza taste better you can try hundreds of things. To make someones life better try Federation. Bring young Jewish adults together, provide for the elderly and educate our youth. Please give to the Tampa Jewish Federation. Youll be helping your community at home and around the world. In lots more ways than we can count. #lotsamatzaThere are lots of ways to eat matza. CELEBRATIONCONTINUED from FRONT PAGEDaily activities to celebrate the Israel @70 will begin with Israeli stories and Israeli wine on Monday, April 16 at the Bryan Glazer Family JCC from 7-8 p.m. Martin Fletcher, a former NBC news Middle East correspondent, will join the program via Skype, along with local guest speaker, Malka Isaac. The two will share talks of real life Israeli experiences. On Tuesday, April 17, sample various hummus recipes along with cooking demonstrations by Sylvia Cohen of the popular chickpea dish. All ages are welcome to participate in this hands on (and lip smacking) experience. The program will take place from 5:30-6:30 p.m. at the JCC on the Cohn Campus. The following night, Wednesday, April 18, an award winning movie, The Matchmaker a 2010 Israeli at the Villagio Cinemas in Car rollwood. During the summer of 1968 a teenage boy goes to work for a matchmaker who has survived the Holocaust and both their lives are changed forever. Next up on Thursday, April 19 teens and tweens will paint their hearts out while Cohn Campus from 4-5:30 p.m. To end the week, on Friday, April 20, young families are invited to join in a Tot Shabbat celebrating Israel. Celebrations will be held at 9:30 a.m. at the Cohn Campus and 3:30 p.m. at the Glazer JCC. The Tot Shabbat will include singing, dancing and lots of fun with friends. For Saturday, April 21, the JCCs and Federation is suggesting Family Night at Home with ideas at www.jewishtampa.com/IID.From the movie, In Search of Israeli Cuisine, guide and chef Michael Solomonov left, samples cheese with Shai Seltzer, a cheesemaker in the Judaen Hills. The documentary will be shown during the April 22 Israel Independence Day event. The Main event Tampas largest celebration of Israels 70th year of independence will take place on Sunday, April 22 at the JCC on the Cohn Campus. Opening the day, will be a Sip & Skype program with Randy Susan Meyers, author of The Widow of Wall Street a ripped-from-theheadlines story about deceit, scandal and guilt. The event will be from 10:30 a.m. noon and includes spirits and a nosh. Cost is $5 per person. At 11 a.m., an hour-long PJ Library Goes to Israel program will be held. There will be crafts, games, songs and reading of the stories Dinosaur Goes to Israel and 3 Falafels in my Pita all just right for children ages 6 months to 6 years. The grand opening and ceremonial ribbon cutting for the Judy Cohn Park and Jack Roth Garden on the campus begins at noon. The ceremony will include presenting of the colors by local war veterans, a Zum Gali Gali concert by the JCC Preschoolers and Club J students. The 70th birthday celebration of Israel continues with DJ John Wendleken playing Israeli music, dancing and trivia all afternoon. Arts & crafts, rides, bounce house, balloon twisting, face-painting afternoon. For adults, there will be Israeli beer and wine tasting in the garden. For those wanting to wind down for awhile, at 1:30 p.m., the movie, In Search of Israeli Cuisine, will be shown. Appropriate for the whole family, the documentary offers a portrait of the Israeli people through food. There is no charge to attend, although there is a $5 per car parking fee and food, beverages and some activities are available for purchase. The JCC on the Cohn campus is located at 13009 Community Campus Drive, off Gunn Highway just east of the Veterans Expressway. This event is sponsored by the Tampa Bay Times, United Janitorial Services and Amscot Financial. For the community events April 16-20, space is limited so participants are asked to register in advance by e-mailing brandy.gold@ jewishtampa.com. More information on weeks, 7 days Celebrating Israel@70 is available at www.jewishtampa. com or call the Tampa JCCs & Federation at (813) 264-9000. About Israel Independence Day The Declaration of Indepen dence for the state of Israel was signed on May 14, 1948 in Tel Aviv. On the Hebrew calendar that is the this year begins at sundown on Wednesday, April 18. It is known as Yom Haatzmaut, which literally means Day of Independence. The day before Yom Haatzmaut is Yom Hazikaron, Day of Remembrance for Israeli fallen soldiers and victims of terrorism. JEWISH PRESS of TAMPA PAGE 15 MARCH 23 APRIL 5, 2018 Organizations Bar Mitzvah $370* rf rr f Savings amounts are averages based on information from The Hartfords AARP Auto Insurance Program customers who became new policyholders between 1/1/16 and 12/31/16 and provided data regarding their savings and prior carrier. Your savings may vary. AARP and its af liates are not insurers. Paid endorsement. The Hartford pays royalty fees to AARP for the use of its intellectual property. These fees are used for the general purposes of AARP. AARP membership is required for Program eligibility in most states. The AARP Automobile Insurance Program from The Hartford is underwritten by Hartford Fire Insurance Company and its af liates, One Hartford Plaza, Hartford, CT 06155. Auto program is currently unavailable in Massachusetts, Canada and U.S. Territories or possessions. Speci c features, credits and discounts may vary and may not be available in all states in accordance with state lings and applicable law. Applicants are individually underwritten and some may not qualify.nnftb fbtn ntrrntbbbbbnbbbttbb bbtbb n tbnbtbn bn bb Anton Legal Group Stock Broker DisputesS. David Anton, Esq. Since 1985Jacob Paul Sams, son of Monica and Andrew Sams of Tampa, will be called to the Torah as a Bar Mitzvah on Saturday, April 7 at Congrega tion Schaarai Zedek in Tampa. Jacob is a seventh grade Headmasters List student at Berkeley Preparatory School. Active in the Spanish Club, he also plays club soccer and tennis. For his mitzvah project, Jacob hosted a Thanksgiving the Holiday Tent at Metropolitan Ministries of Tampa. Monica and Andrew Sams will host a celebration at Palma Ceia Golf and Country Club on Saturday evening, April 7. Special guests will include grandparents Alice and Stanley Rosenthal from Tampa and Dave and Betsy Sams from Vero Beach, along with family and friends from coast to coast. Jacob Paul SamsGenealogical SocietyMembers helping members: The Jewish Genealogical Society of Tampa Bay will meet on Sunday April 8 at 2 p.m. at Gulf Coast Jewish Family & Community Services, 14041 Icot Blvd., Clearwater, for a hands-on working session for individual research using the Internet and library resources of the organization. Experienced society mentors will be on hand to provide guidance and assistance. Free access to Ancestry.com and to MyHeritage.com (Premium), will be offered on several computers and available for use. Attendees are asked to bring their own research materials and information and their own laptop computer if they have one. A presession social with refreshments and library access begins at 1:30 p.m. For information about the organization or directions to the meeting, call Bruce Hadburg at (727) 796-7981.Young Adults#Gather offers a mix of social and interactive activities designed to help young adults connect. It is open to young adults of all faiths and backgrounds. For more information or to RSVP for any #Gather events, visit: www.bryanglazerfamilyjcc.com/gather or contact Lisa Robbins at lisa.robbins@jewishtampa.com or (813) 769-4723. Flavor tripping: The #Gather group will meet Monday, April 9 from 6:30-8:30 p.m. at 81 Bay Brewing Company, 4465 W. Gandy Blvd, Tampa, to experience the miracle berry from West Africa that turns tart and savory foods denly tastes like lemonade. Cheese tastes like frosting. Vinegar tastes like apple juice. The cost is $5 for members and $10 for guests. Halfable for $5. Spin class: Join in a high-energy spin class with other #Gather members at the Glazer JCC on Monday, April 23 at 6:30 p.m. This is free for members and $7 for guests and includes access to the entire JCC for the day. Pedal through hill climbs, sprints and interval training with motivational music to help push you through the challenge. Cool down with a smoothie by the pool together. Reserve your bike today. Job-LinksMonday Morning Links: Free sessions of Monday Morning Links are offered at the Jack Roth Center for Career Development at TampaBay-Job-Links, 4100 W. Kennedy Blvd., Suite 206, Tampa from 9:30 11 a.m. On April 2 the topic is Whats Your Nonverbal Communication Saying? On April 9 the topic is The 7 Habits of Highly Effective Job Seekers and on April 16 the topic is How to Work the Room at a Networking Event or Job Fair. Monday Morning Links is supported by the Vinik Family Foundation. Job-search aids: The next Success workshop will be Thursday, April 5 from 9:30 a.m. to 12:30 p.m. The topic is Steps to Negotiate a Job Offer and on April 12 it is Mastering Change and Transition. The workshops are free for TampaBay Job-Links full program participants and $15 for guests. Reservations required for all programs. To RSVP, call (813) 344-0200, email RSVP@TBJL. org. Boot camp: In partnership with Congregation Bnai Israel of St. Petersburg, Gulf Coast Jewish Family and Community Services, and the Jewish Federation of Pinellas and Pasco Counties, TampaBay-Job-Links will present a full-day Job-Search Boot Camp providing tools and strategies to help individuals in career transition kick their job search into high gear. The workshop will take place at Congregation Bnai Israel, 300 58th St. N., St. Petersburg, on Wednesday, April 25 from 9 a.m. to 5 p.m. The cost to attend is $25, and a kosher lunch will be provided. Advance registration is required, and seating is limited. To register, call TampaBayJob-Links at (813) 344-0200 or email RSVP@TBJL.org by April 18.Jewish War VeteransVolunteers needed: The Jewish War Veterans Post 373 is seeking members who would like to help ill and disabled veterans. Contact Commander Jack Rudowsky at (813) 598-8061 or email rochelletsr@gmail.com. Active AdultsAll programs listed are either at the Maureen & Douglas Cohn Jewish Community Campus, 13009 Community Campus Drive, or at the Bryan Glazer Family JCC at 522 N. Howard Ave. To RSVP or for more information on programs at either center, contact Pnina Levermore at (813) 291-2253 or pnina.levermore@JewishTampa. com. All registrations should be completed before events begin. Culture Caf: Enjoy a taste of Jewish Food, music and dress at a Culture Caf event at the Glazer JCC on Wednesday, April 25 from 7-8:30 p.m. Cost is $10 for members and $15 for guests. Bridge lessons: Those who want to learn how to play bridge or improve their game can take bridge classes at the Glazer JCC on Fridays April 13-May 18. This is for players at any level and sessions are from 1-2:30 p.m. The cost is $50 for members; $60 for non-members. There are also open play bridge days on Mondays at the Glazer JCC from 10:30 a.m. to noon. This is free for members and $10 for non-members. Mens Club: This group will meet on Tuesdays, April 10 and 24 from 5-6:30 p.m. at the Glazer JCC for men to gather in relaxed and friendly surroundings. Potential activities include poker, billiards, ping-pong, sporting events, volunteering or discussions. The whole enchilada: Take a class at the Glazer JCC that Wednesdays, April 4 25 from 10 a.m. to noon, taught by June Kittay and Eric Pfeiffer. Combine the advantages of physical and fun and enhanced health. The cost is $40. This is an Osher class offered through USF. For more information and to register, contact the USF Institute of Life Long Learning at (813) 974-8036. Plugged in workshop: In the coming weeks dates to be announced later there will be workshops at the Glazer JCC on cloud storage and managing device storage and what to look for in choosing a device. This is a free program, but advanced registration required. Biblical literature: This course, which meets at the Cohn campus every other Wednesday from 1:30 2:30 p.m., provides an opportunity to see the Bible not from a religious perspective but as a piece of remarkable writing. The next classes are on April 11 and 25. This is a discussion course with participation open to people of all faiths and backgrounds. Bring your own Bible so participants can compare different translations. Cost is $3 for members and $4 for guests Canasta: Meet in the senior lounge at the Cohn campus every Friday from 3-4:30 p.m. for friendly games of canasta. Movie matinee: Enjoy a classic movie and popcorn on from 10 a.m. to noon on the Cohn campus. There is no charge to attend. On April 4, the movie will be Daniel. Yiddish nostalgia: Join Ruth Weston and other Yiddish enthusiasts on Thursday, April 26 from 12:30-1:30 p.m. at the Cohn campus to share favorite expressions and reminisce. This program is free. Crochet lessons: Learn crochet with instructor Judy Balber every Monday on the Cohn campus from 10:30 a.m. to noon. Bring yarn, crochet hooks and any pattern you want. Cost is $25 for members; $30 for non-members with prorating options available. Mah jongg: Folks can play at both JCCs. At the Cohn campus, there is free open play sessions every Tuesday and Thursday from 1:30 3:30 p.m. At the Glazer JCC, drop-in sessions are offered on Mondays, Tuesdays and Thursdays from 1-3 p.m. This is free for all members. Novices and experienced players are welcome. JetSetters: The Phyllis Borrell JetSetters social group for adults of all ages meets at both JCCs for an hour-long program followed by lunch. The JetSetters group meets on the Cohn campus on the fourth Thursday of the month from 11 a.m. to noon. On Thursday, April 26 enjoy singing along to vaudeville tunes with Joy Katzen-Guthrie The lunch is free for members, though a donation of $5 is sug gested. At the Glazer JCC, JetSetters meet on the second Wednesday of the month from 11 a.m. to noon. The lunch is free for members, but donations are welcome. On April 11 there will be a presentation on From Russia with Love. News talk: This discussion group, meeting at both JCCs, is led by Pat Renfroe and explores hot button issues of the day. Upcoming News Talk sessions at the Glazer JCC are Tuesdays from 7-8:30 p.m. The group at the Cohn campus, meets the second and fourth Friday from 10:30 a.m. to noon. The topic on April 13 will be the Florida legislature and the Constitutional Review Commission and on April 27 the topic will be What American values seem to have been set aside. There is no charge to attend at either location. The other four questions: Rabbi Jason Rosenberg of Congregation Beth Am will lead classes to explain the backholidays. The next class, on Purim, Hanukkah and other minor days, is Wednesday, April 11 at noon at the Cohn campus. Trivial Pursuit and pizza: Enjoy pizza and exercise your mind on Thursday, April 12 from 11:45 a.m. to 1 p.m. at the Cohn campus. There is no charge.Support groups Alzheimers caregiver: Menorah Manor offers a support group meeting in the Samson Nursing Center at Menorah Manor, 255 59th St. N., St. Petersburg, from 3:30-5 p.m. For more information, call Gwen Kaldenberg at (727) 3023750. 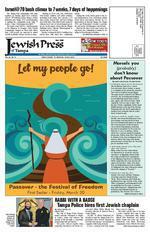 Happy Passover from these Businesses & Professionals PAGE 16 JEWISH PRESS of TAMPA MARCH 23 APRIL 5, 2018 ADVERTISE in the Business & Professional Directoryfor as little as $38 per issue 813-871-2332 CLASSIFIEDS ADS advertising. The paper accepts no responsibility for services and merchandise advertised, nor screens advertisers. All ads must be submitted in writing. Mail to PO Box 6970, Clearwater, FL 33758; fax (727) 5303039 or e-mail: jewishpress@aol.com Rates: $10 for 15 words, 10 each additional word. ORACLEINSURANCE Marc D. Ostroff Agency Principal 2605 S. MacDill Ave. Tampa, FL 33692 P | 813.259.9600 F | 813.259.9602marc@trustoracle.com www.trustoracle.com Home | Auto | Commercial | Life OBITUARIES of Jewish community members, both local residents and individuals whose survivors live in the area, are published as a FREE public service in the Jewish Press, based on information supplied by the family to the funeral home. Informaiton may also be submitted directly in writing to the Jewish Press. Email to jewishpress@aol.com. The information contained in the published obituary is at the discretion of the Jewish Press. POSITION AVAILABLE Obituaries JEWISH PRESS has OPENINGS for:SUMMER INTERNS College student with journalism major preferred. Duties will include writing assignments and clerical work. Paid position. Parttime. Flexible hours. Must have transportation. S end resume with clips, if available.Karen Dawkins, managing editor PO Box 6970, Clearwater, FL 33758 email: jewishpress@aol.com. or call, (727) 535-4400 or (813) 871-2332. SERVICESACCOUNTANT SINGER CONSULTING: Robert S inger, Accountant. Personal & Corporate Tax Preparation. Corporate Financial S tatements. (813) 404-1004 rsingertampa@aol.com. ESTHER JEAN PLOWDEN (JEANNIE), 83, of Tampa, died March 11. A pharmacist for 51 years, she was an active volunteer in the school system, the Judeo-Christian Clinic and the Suicide and Crisis Prevention Center. Survivors include her son Randy Pisetzky (Karen Haag); daughter Lorna grandchildren. (Segal Funeral Home, Beth David Chapel)By JOSEFIN DOLSTEN JTA news serviceNEW YORK The Torah tells how God created the earth and the heavens, although the stories that follow tell us more about the former than the latter. A new exhibit doesnt quite answer theological questions about space, but it does show the ways in which Jews have looked at, written about and travJews in Space: Members of the Tribe in Orbit, named after a Mel Brooks gag, is an exhibit organized and on view at the YIVO Institute for Jewish Research and the Center for Jewish History here. It features both Yiddish and Hebrew books on astronomy and astrology, Jews and sections on the history of Jewish astronauts. JTA was given a tour by Eddy Portnoy, YIVOs senior researcher and director of exhibitions, who co-curated the collection, and learned about some of the unusual and unexpected relationship between Jews and the cosmos. to go into space was a woman. Jewish American and second Jew (Soviet astronaut Boris Volynov the Space Shuttle Discovery in 1984. Born in 1949 to Jewish immigrants from Ukraine who settled in Ohio, Resnik worked as an engineer at the Xerox Corp. before being recruited to NASA in a program to diversify its workforce. Resnik was only the fourth female to ever do so. She died in 1986 along with the rest of the crew of the Space Shuttle Challenger when the spacecraft broke apart shortly after takeoff. In 1985, a Jewish-American astronaut read from the Torah in space. Jewish-American man to go into space, consulted a rabbi on how trip, in 1985. Hoffman, a Brooklyn native who was born in 1944, brought with him a scaled-down Torah and Torah reading outside of Earth. He also had a set of Jewish ritual items specially made for his trip, including a mezuzah with a Velcro strip that he would attach to his bunk and a tallit with weights to keep it ty. He also brought a menorah to celebrate Hanukkah, although he was never able to actually light it aboard the spacecraft. The Vulcan salute on Star Trek has Jewish origins. Actor Leonard Nimoy used an unlikely source of inspiration for his character Spocks iconic Vulcan salute, which consists of a raised hand with the middle and gesture looks just like the one Kohanim do in synagogue during the Priestly Blessing. In his autobiography, Nimoy explained that he had copied the Jewish ges-The rst Torah reading in orbit and other fun facts about Jews in space Astronaut Jeffrey Hoffman Leonard Nimoy, as Spock on Star Trek giving the Vulcan salute. Mission specialist Judith Resnik sending a message to her father from the shuttle Discovery on on its maiden voyage, Aug. 30, 1984. NASA/Space Frontiers/Getty Imagesture, which he had seen in a synagogue as a child (it also appears Vulcan salute, which is accompanied by the phrase Live long and prosper (the Kohanims blessing begins May God bless you and that the White House mentioned it in a statement issued on Nimoys death in 2015. A Jewish immigrant to the U.S. Hugo Gernsback, a Jewish immigrant from Luxembourg, is sometimes called The Father of Science Fiction for publishing a magazine that helped popularize the genre. Launched in 1926, Amazing Stories featured tales of aliens, robots and other beings, including ones written by Gernsback himself. His magazine and inspired many writers, such as Jerry Siegel and Joe Shuster, the Jewish-American duo that created Superman. Gernsback left Amazing Stories in 1929, although it held on in one form or another until 2005. Among the Jewish writlished in the magazine were Isaac Asimov and Howard Fast. This book of horoscopes was written in Yiddish. Published in 1907 in Odessa, Ukraine, The Revealer of That Which Is Hidden: A New Practical Book of Fate gave Yiddish readers a way to learn about their futures by way of astrology. The book offered predictions based on the readers zodiac sign. Similar books existed both in Yiddish and Hebrew during the time period, but rabbinic authorities were not thrilled, since astrology is banned by Jewish law (although zodiac symbols have shown up as synagogue decorations for at Jews at the time continued to read horoscopes as well as seek other ways of predicting the future, such as by going to psychics and reading tea leaves. JEWISH PRESS of TAMPA PAGE 17 MARCH 23 APRIL 5, 2018Support Our Advertisers! They help make the Jewish Press possible RALPH BOBOArea/Branch ManagerNMLS ID 432371 State Lic. L025098 3903 Northdale Boulevard, Tampa, FL 33624C: 813.781.1024 Ralph.bobo@caliberhomeloans.com www.RalphBobo.com It will be an afternoon of speeches, food, family fun, photographic art, music and festivities when the Pinellas/Pasco Jewish community celebrates the 70th anniversary of the birth of Israel on Sunday, April 15 in Largo. Hosted by the Jewish Federation of Pinellas and Pasco Counties, the free celebration will be held at the Creative Pinellas/ Pinewood Cultural Center, 12211 Walsingham Road, Largo, from 1 to 4 p.m. One of the featured guests at the festivities will be Israeli photographer Erez Kaganovits, who will talk about an exhibit of his work, Humans of Tel Aviv, that will be on display throughout the day. What I love most about this project is that I can reach people in a way that Im not forcing my ideas upon others, but rather simply taking a photo, telling a story, and letting it speak for itself, the photographer said. A variety of other speakers also will be on hand to remind folks of the importance of the Jewish state and what the nation faces as it continues to grow and bloom. Rabbi Ed Rosenthal of Hillels of the Florida Suncoast will speak about the challenges Jewish students face on college campuses around the Tampa Bay area when speakers and student groups voice positions against Israel. Two authors will discuss their Jewish-themed books. Roslyn Franken of Seminole will talk about her book, Meant To Be: A True Story of Might, Miracles and Triumph of the Human Spirit. It is a love story about how her mom, who survived Nazi concentration camps, and dad, who was in a Japanese prisoner of war camp, met and fell in love. Lynda Lippman-Lockhart of St. Petersburg will also speak about her book, The Laundry Room, a tale of Israeli resistance in 1946. Eric Lynn of St. Petersburg, who played a large role in getting approval and funding for Israels Iron Dome rocket defense system, will discuss his work on the project. There will be a sing-a-long, complimentary traditional Israeli and Jewish food, and fun for kids that includes a bounce house, an archeological dig, face painting, balloon art and the opportunity to For all ages, there will be Krav Maga self defense demonstrations and Israeli dancing. Learn more about the celebration at www.jewishpinellas.org or call (727) 530-3223.Across the bay: Israel celebration in Largo will feature something for all Photographer Erez Kaganovits, creator of the Humans of Tel Aviv exhibit, right, will be at the Pinellas Israel Independence Day event on Sunday, April 15.